Late in the fourth quarter, senior safety Keronte Walker came up with two big plays in the end zone to protect the Missouri Tigers four-point lead and give Mizzou a 24-20 win over the Arizona State Sun Devils, Saturday night at Faurot Field. It was the type of game fans should start getting used to this season. After the game, head coach Gary Pinkel said, “It ain’t gonna look pretty all the time.” With an inexperienced offensive line blocking for redshirt freshman Corbin Berkstresser at quarterback and problems in the kicking game, Mizzou’s success will largely rest on the shoulders of the defense. The Sun Devils put together a 12 play drive to cut the Tigers lead to 24-14 with 14 minutes to play in the game. After a quick three and out, the ASU offense was back on the move. Pinkel admitted they may have been a bit conservative with their play calling with Berkstresser getting the start over James Franklin, who was a late scratch with shoulder soreness. A 34 yard pass from ASU quarterback Kelly Taylor to Marion Grice got the ball to the Mizzou 25. Another 16 yard completion and a nine yard touchdown run by Grice pulled the Sun Devils to 24-20. ASU botched the point after try. The drive covered five plays, 59 yards in 1:49. Berkstresser converted on three, third down conversions to get the Tigers in position for a field goal that would have made it a seven point game, but freshman kicker Andrew Baggett missed his third field goal of the night when T.J. Moe bobbled the snap. The Sun Devils went back to work to drive the field and get down to the one yard line, thanks in part to a personal foul facemask penalty on Sheldon Ricahrdson and a pass interference penalty in the endzone. On third and goal from the one, Kony Ealy stopped ASU’s second quarterback Michael Eubank bringing up a 4th and goal from the three. With Taylor, back in the game, he rolled right and had his pass tipped away by Keronte Walker. Arizona State took over with 1:58 to play at the Mizzou 21, following a three and out and 39 yard punt from Trey Barrow. Taylor was stopped on two rushes and on 3rd and 10 aimed for the end zone, but Walker stepped in front of the pass and took all the way out to midfield preserving the win. Berkstresser gave himself a five on a scale of 1-10 when rating his game. He was 21 of 41 for 198 yards and his one questionable pass came when he threw an interception at the ASU three yard line which came late in the first half with Mizzou up 17-0. Berkstresser also showed great poise in key situations as the offense finished 10 of 22 on third down conversions. 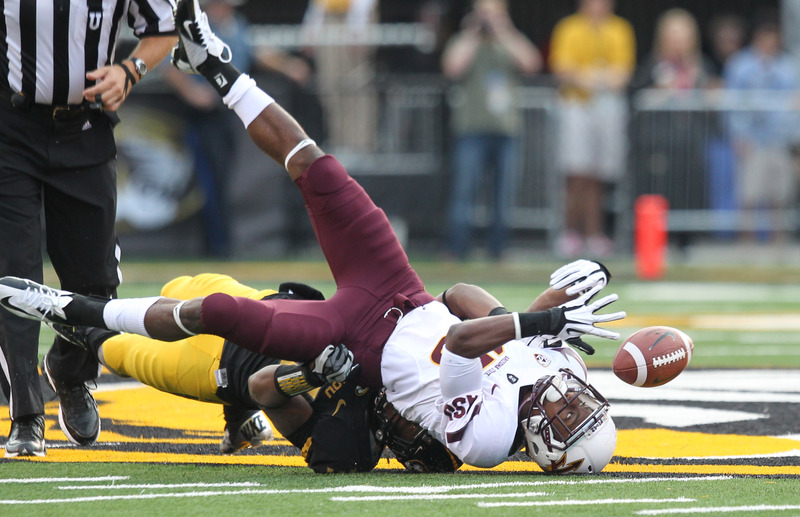 Pinkel credited ASU quarterback Taylor with giving his team a chance in the game. After being held to 22 yards of total offense with just over three minutes to play in the first half, Taylor manufactured three scoring drives and if not for a botched field goal attempt on their third touchdown, ASU had short fields to work with for what could have been game tying field goals. The Mizzou defense came up with two picks, two fumble recoveries and three sacks. Sheldon Richardson, who last week called Georgia head coach Mark Richt after the loss and apologized for his ‘old man football comment,’ tied for the team lead with nine tackles with Andrew Wilson. The Tigers held ASU to 296 yards of total offense, but 203 of that came in the second half including 122 in the fourth quarter. Berkstresser led the Tigers down on their opening drive of the game for a 48 yard field goal from Baggett. Midway through the first quarter, Wilson punched the ball out of the hands of Jamal Miles who fumbled a 59 yard punt by Trey Barrow. Edwards recovered at the ASU 18 and four plays later, Berkstresser scored his first collegiate touchdown on a six yard run to put Mizzou up 10-0. Special teams helped set up Mizzou’s second touchdown. After a 62 yard punt from ASU’s Josh Hubner, Marcus Murphy pitched to E.J. Gaines who returned it 44 yards to the ASU 18. Kendial Lawrence ran the ball three times scoring his first of two touchdowns after Berkstresser found Moe for a 28 yard pass to get Mizzou down to the ASU six on first down. Lawrence added a one yard dive in the third quarter that gave the Tigers a 24-7 lead after three quarters.